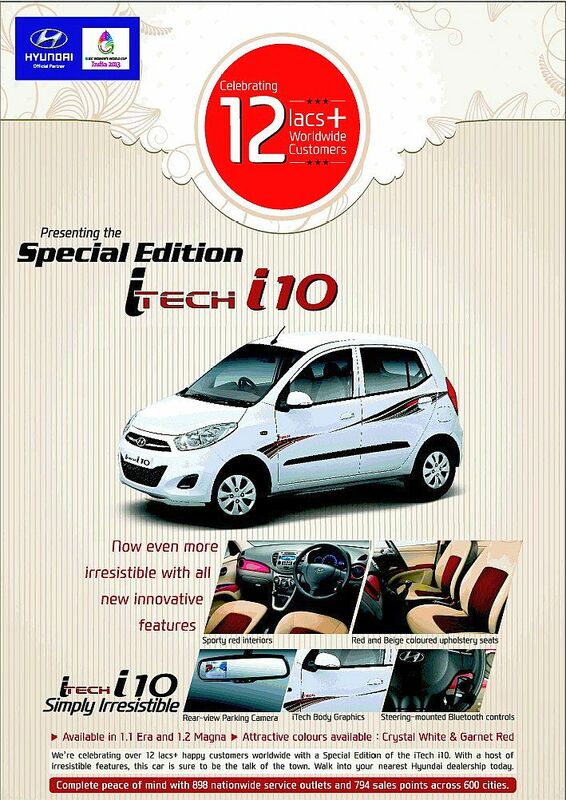 Hyundai's i10 has crossed a figures of global sales of 1.2 million vehicles and the Korean carmaker has decided to celebrate the moment along with all its customers worldwide and has launched a special edition iTech i10 variant. The special edition variant will be available only in 1.1 Era and 1.2L Magna variants. Meanwhile, this could also be considered as a promotional scheme where in the company would like to cash on this outgoing model, the maximum it can, as the next generation Hyundai i10 is already under testing and is expected to hit the markets during 2013 festive season - near Diwali. The next gen Hyundai i10 would be powered by 1.1L U series Diesel engine apart from the regular Petrol, CNG & LPG variants available.